Whatever Kalia touches turns to gold! But his glory is short lived as he realizes that he can not even eat his favorite laddoos! Bheem helps him get rid of the curse. Avi chacha creates a bicycle which does not stop and Raju is extremely excited. A notorious thief sees this as the optimum chance to rob the people of Dholakpur. Will Bheem be able to stop the menace? 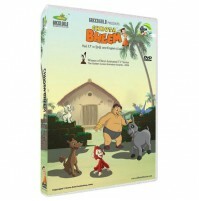 Join the fun when Bheem and his team save Professor Dhoomketu when he gets kidnapped. Kalia, Dholu and Bholu eat fruits from a forbidden tree and turn into cat and mice! Have fun watching them!